There is still time to participate in the 12th Annual SOL Bowl. With the tagline, “Laissez les bon temps bowle!” (Let the good times bowl!) the event will take place this weekend at Colonial Bowling Lanes in Harahan, Louisiana. Team up with past and present NFL, NBA and MLB players, as well as, local news and sports media personalities to bowl for a good cause! Special Olympics Louisiana, The NFL Players Association, Kenner and Harahan Police Departments, invite businesses and the community to register their team. This event joins businesses with local celebrities and SOLA athletes all bowling together while enjoying a day of fun, food, and music. The event is open to the public and will be held on Sunday, May 18th at 11:30am to 3:00pm at Colonial Bowling Lanes in Harahan, Louisiana. There will be food, drinks, raffle items, awards for those who bowl a strike and a silent auction. Participants looking to join in on the fun can contact Maria Sanchez at msanchez@laso.org or call 1-800-345-6644. 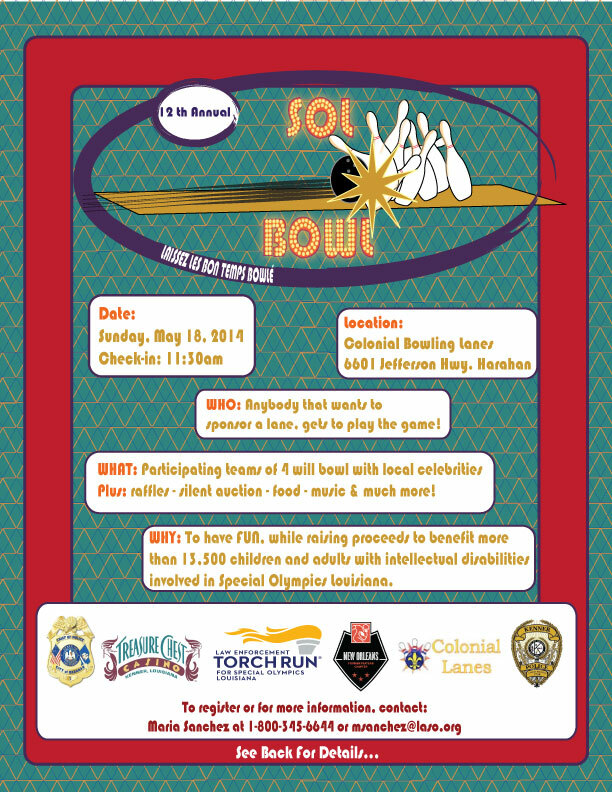 Yesterday, the 10th Annual SOL Bowl took place at Colonial Bowling Lanes in Harahan, LA. Local Celebrities came out to bowl for Special Olympics Louisiana. Current Saints players, Jed Collins, Matt Tennant and Malcolm Jenkins headlined the event. Other celebrities included WWLTV’s Doug Mouton, WDSU TV Travers & Fletcher M ackel, Randi Rousseau, and Scott Walker. FOX 8’s own Jessica Holly was also in attendance. WIST Radio Brian Alle Walsh and Larry Holder bowled a few frames, too. Former NFL, MLB, and NBA stars were also in attendance including Gary Barbaro. Twelve companies came out to the event and competed. Thank you to the following companies for your support of Special Olympics Louisiana: B & K Construction, Barbaro Family, Cox Communications, Harahan Police Department, Irish Channel St. Patricks Day Club, Kenner Wal-Mart, Laser Amusement, Legette Construction, Otto Candies, LLC, RJK Insurance Services, Skanska MAPP, and Treasure Chest Casino . The biggest celebrities of the day were our Special Olympics Louisiana Athletes! Our athletes competed along side the pro-athletes and did a great job! Check out this WWLTV spot on SOL Bowl! 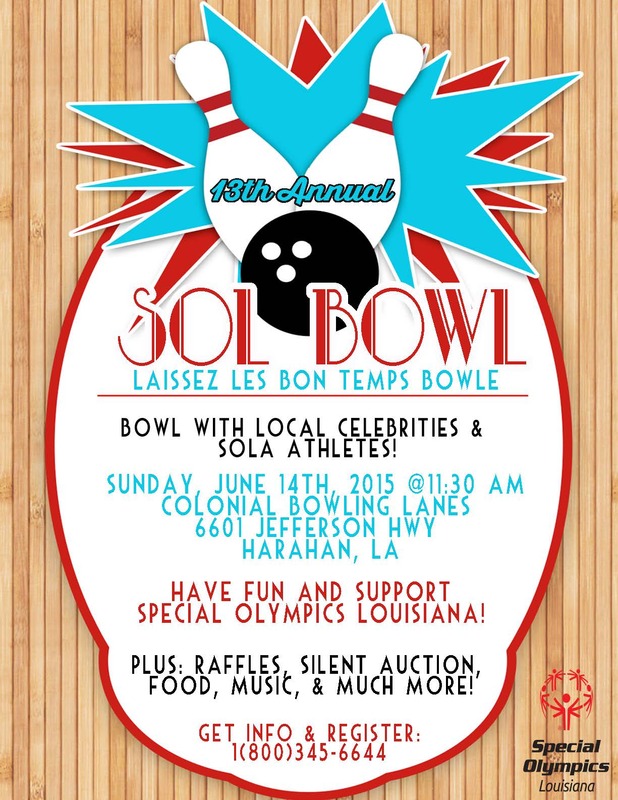 Be sure to follow us on Twitter, @SOLouisiana, to see what all the buzz was about at SOL Bowl.